Things have been rather busy over the last couple of months. I’ve joined a new division at my current company and have the basis for another dozen articles slowly developing but that’s just the start. I have some really exciting news! After over a year of development with the exceptionally talented Johanna Hunt (@joh) through field testing, workshops, paper prototypes, conferences, conversations, and peer reviews I’m very pleased to announce the launch of crackingbigrocks.com. In trying to solve problems of our own, we found challenges that we now identify as “Big Rock” problems – those things that when faced alone cause us sleepless nights and illogical stress. The mental load associated with Big Rock problems can be so taxing that every time we go to tackle them we find ourselves procrastinating and avoiding or exhausted through trying. A deep breath, a step back, a few pointers, a second brain and some support can help us get back on track. We’ve faced these problems in both our personal lives and professional careers. For example the series of articles I wrote on “The Oubliette” describes the multiple strategies I used for reducing a major defect backlog. As of about June 2013, the first edition has sold out however the expanded second edition is now available on amazon. It turns out the ideas and concepts we’ve captured and the formats we’ve chosen are significantly more popular than we expected. Back in August 2012 after a weekend of hand-trimming and cutting (causing a few injuries and RSI) we produced nearly 40 paper prototype decks with unedited wording and far fewer patterns. We gave all of these away and left a few attendees disappointed after running a hugely successful workshop to a packed-out room of nearly 80 attendees at Agile 2012. A month later we had to produce a few extras for a re-run at Agile Cambridge (and took the opportunity for some edits whilst we were at it). We delivered our first bulk-order for nearly 200 decks for attendees at Agile Cambridge in 2013 and ran another packed-out session. Our good friend Olaf regularly takes a few sets out with him to Play4Agile in Germany. Even whilst developing and trimming the original prototype decks, we actually used the patterns within the decks to “keep rolling” – the idea of having to manually cut out and collate over 1500 paper playing cards is quite a “Big Rock” in itself. We measured our throughput rate, adjusted our cutting process, optimised our flow and working practices, banked our results in suitable sized batches and made sure our pace was (mostly) sustainable! The majority of patterns in the deck are unique to us but there’s a couple that are better known (such as the “Rubber Duck” shown above). What’s unique here is the format, approach, style and most intriguingly, the community we’re aiming to build. 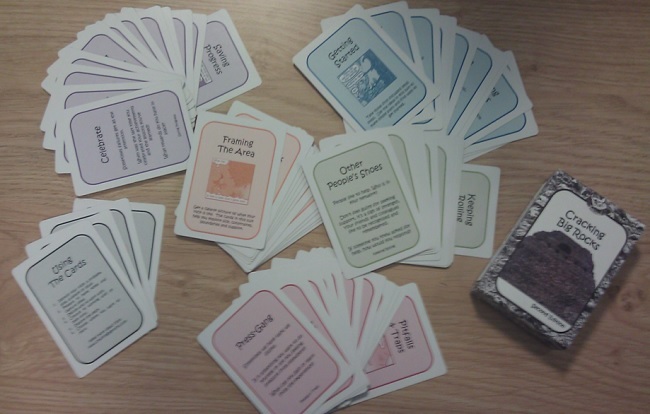 We want to share the ideas and experiences everyone has using these cards as coaching and problem-solving tools. If you’d like to find out more, head on over to crackingbigrocks.com and take a look. OK. Marketing over – I generally find selling or marketing what we do a little crass so I hope you as readers don’t mind too much! This entry was posted in People, Simple Patterns, Simple Tools and tagged big rocks, pattern by The Captain. Bookmark the permalink.